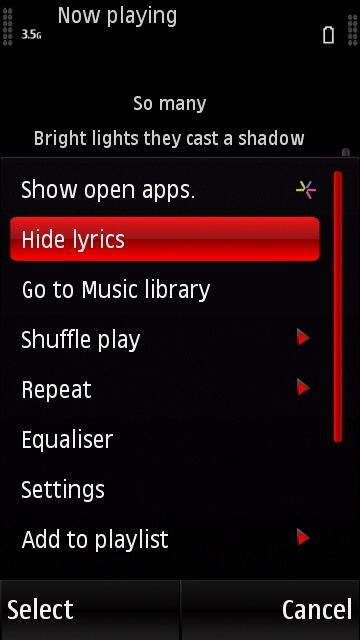 Go to Now Playing in music player and next to Options and enable the lyrics mode. Your mp3 or songs should have an embedded lyrics on it. Most songs do not have that, but many free software that you can use are available on the internet. Examples of that are Media Monkey, MiniLyrics etc. Another way to embed lyrics is to make the same folder for .lrc file (lyrics) and .mp3 songs. Put them on the same folder with the same name but with different file type for example Billionaire.lrc and Billionaire.mp3, and after that the Music Player will read it which you can enable the lyrics. If you have other tips or tutorials please share on this article. Thanks! Go to Menu > Applications > SW Update or type *#0000# in home screen and select check for software updates. You need to be connected to a WiFi or 3G in order to check for updates. After the update, there is no such option as shown in your screen. I checked the installation log, and it does record that the update is finished. And I also restart the phone after the update. Try exploring the music player…if still not there it might be your REGION’s software package don’t have this update yet..but sooner you will get that too. I was looking for this for so long how to play with lyrics. It worked for me with the .lrc file. OT: Can you please tell me the name of the theme you were using while making the screenshots? im doing this a biiiillllion times, nothing happen ..i aint play’n this kind of **** . Anybody has some advice? I don’t understand how to get an irc file and put it with the song.